This is probably one of the most difficult perspectives to compose of this 213 ft waterfall. 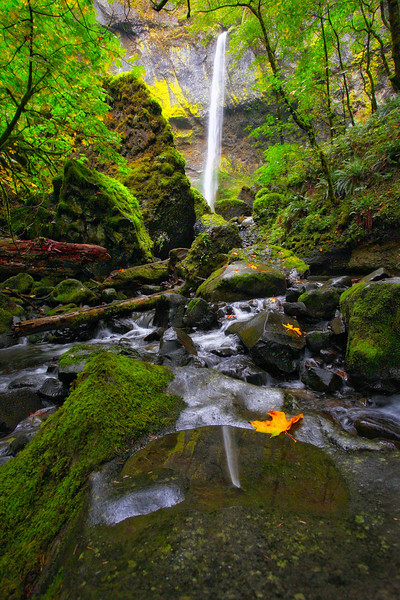 To align the reflection in the small pool with the falls requires moving your tripod legs up and down by 1/4 to 1/2 intervals while performing a balancing act on a narrow slippery log. Like the saying goes "patience has its virtue". Worth the effort - this is wonderful! spectacular result for your efforts. No broken bones, I hope. Gorgeous! Sounds like a difficult shot to get.